William Pierce Rogers served as President Richard M. Nixon’s Secretary of State from January 22, 1969, until September 3, 1973. Although often overshadowed by the Assistant to the President for National Security Affairs and his own successor, Henry Kissinger, Rogers proved to be an accomplished administrator and diplomat. Rogers was born in Norfolk, New York, on June 23, 1913. He graduated from Colgate University in 1934 and earned a law degree from Cornell University in 1937. He was admitted to the New York bar in 1937 and to the Washington, D.C. bar in 1950. 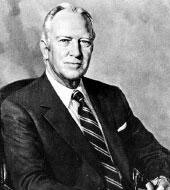 Rogers was an Assistant District Attorney of New York County from 1938 to 1942 and then again from 1946 to 1947. After serving as a lieutenant commander in the U.S. Navy during World War Two, Rogers provided counsel to the U.S. Senate Special Committee to Investigate the National Defense Program between 1947 and 1948. He then became Chief Counsel to the Senate Investigations Subcommittee of the Executive Expenditures Committee, a position he held until 1950. He practiced law from 1950 to 1953 in New York City and Washington, D.C. before returning to public service in 1953 to become Deputy Attorney General in the Eisenhower administration. In 1957, he became Attorney General. Between 1961 and 1968, Rogers returned to private practice but remained involved in public service as an alternate representative of the U.S. delegation to the 20th Session of the U.N. General Assembly in 1965, on the U.N. Ad Hoc Committee for Southwest Africa in 1967, and as a member of the President's National Commission on Law Enforcement and Administration of Justice from 1965 to 1967. Following his tenure as Secretary of State, Rogers again returned to private law practice. He was awarded the Presidential Medal of Freedom on October 15, 1973. William Rogers died in 2001. As Secretary of State, Rogers promoted a cease-fire in the Middle East in 1970, which lasted until the 1973 war, dealt with problems of security and cooperation in Europe, signed the 1973 Vietnam peace agreement, and brought the State Department into the electronic age by ordering the installation of a computerized system to store diplomatic documents and information. Rogers is best known for his efforts to broker a lasting peace settlement between Israel, its Arab neighbors, and the Palestinian refugees. In a December 9, 1969 speech Rogers unveiled what would later become known as the “Rogers Plan,” calling for collective action on the part of the United States, the Soviet Union, the United Kingdom, and France to implement U.N. Resolution 242, which ended the Third Arab-Israeli War. Ultimately, none of the concerned parties were able to agree on a suitable framework for implementing Rogers’ initiative, thereby leading to the outbreak of the Fourth Arab-Israeli War in October 1973. Rogers’ successor, Dr. Henry Kissinger, did, however, begin the process of securing a negotiated Israeli withdrawal from the Sinai in 1974 as a result of the “shuttle diplomacy” that ended the October War.